April 16, 2011 - L-3 Communications announced that its Platform Integration division has been approved to begin low-rate initial production (LRIP) of the U.S. Navy’s EP-3E Spiral 3-configured aircraft, featuring an upgraded intelligence, surveillance and reconnaissance (ISR) mission avionics suite. Under the LRIP program, L-3 will manufacture and install this new capability on three EP-3E aircraft. 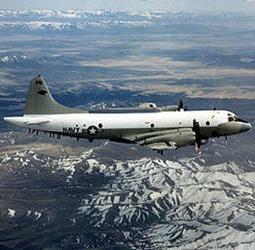 The Lockheed EP-3 is the reconnaissance version of the P-3 Orion, operated by the United States Navy. A total of 12 P-3C aircraft were converted to replace older versions of the aircraft, which had been converted in the late 1960s and early 1970s. The aircraft are known by the acronym ARIES, or "Airborne Reconnaissance Integrated Electronic System". The squadrons that flew the EP-3E also flew the Lockheed EC-121 Warning Star from 1962 to 1974 and the Douglas EA-3B Skywarrior from 1960 to 1991. There are 11 EP-3Es in the Navy's inventory, the last of which was delivered in 1997. The successful completion of developmental testing using the L-3-modified prototype EP-3E Spiral 3-configured aircraft provided the basis for the Navy’s LRIP decision. The operational test phase of this project is currently underway, after which a full-rate production decision will be made regarding the modifications of the remaining aircraft in the EP-3E fleet to the Spiral 3 configuration. As part of the Spiral 3 modification, L-3 will install state-of-the-art communications intelligence (COMINT) equipment, replacing aging and obsolete sensors and increasing the aircraft’s networking capabilities. These modifications improve onboard data analysis and provide real-time tactical intelligence dissemination. L-3 began design of the Spiral 3 improvements in late 2007, delivering the prototype used for testing in 2010. L-3 Platform Integration provides complex integration services for military, commercial and OEM customers at its aircraft integration facility in Waco, Texas. Its products and services include avionics and aircraft modernization, flight sciences engineering and certification, MRO, major modifications, VIP interior completion, and serving as prime contractor for the C-27J Joint Cargo Aircraft. Headquartered in New York City, L-3 Communications employs approximately 63,000 people worldwide and is a prime contractor in C3ISR (Command, Control, Communications, Intelligence, Surveillance and Reconnaissance) systems, aircraft modernization and maintenance, and government services. L-3 is also a leading provider of a broad range of electronic systems used on military and commercial platforms. The company reported 2010 sales of $15.7 billion.